Bridget and some of her colleagues were honored to be included in an intimate audience with His Holiness the Lalai Lama during his recent visit to Washington to accept the Congressional Gold Medal. The video of HH’s remarks is, well, amazing. Please take a look at it, I guarantee you’ll be moved and inspired. With disarming giggles and self-effacing humor he conveys a tightly packed bundle of wisdom about the importance and holiness of all sentient life. The Dalai Lama, spiritual leader of the Tibetan people, with fans and followers around the world, always describes himself as “a simple monk.” But in his remarks to the Humane Society and a coalition for the homeless, he said “I myself am also homeless.” For most of his life he has been in exile from Tibet, having escaped from a harsh Communist Chinese occupation in a daring trek over the Himalayans in 1959. Since then he has traveled the world tirelessly making the case for compassion, religious tolerance, and autonomy for Tibet. His remarks the other day were especially poignant for animal lovers – and fairly mind-blowing for on-again-off-again vegetarians like me. With few words and a simple gesture he conjured a vivid image of the misery of farm animals that we “regard as vegetables.” To the Dalai Lama, a plate of shrimp is not a feast, but a tragedy: “Too many lives, too many lives.” Whew. And I had just suggested to Brett that we check out the “ShrimpFest” at Red Lobster… I’m seeing things with new eyes. Over the course of his amazing life the Dalai Lama, who was awarded the Nobel Peace Prize in 1989, has become one of the world’s most effective communicators. This is perhaps why the Chinese have their knickers in a twist over the honors the U.S. and other nations have bestowed upon him. Check out this piece he wrote for the Washington Post while he was in town: with laser-like precision and an elegant economy of words he hones right in on the most important issues facing humanity: aggression, compassion, tolerance. 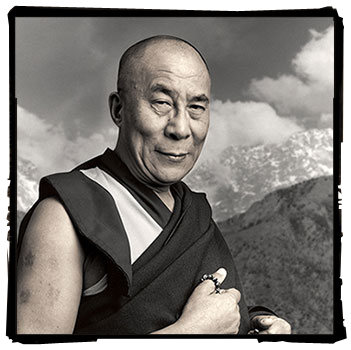 Find out more about the Dalai Lama at his official website, and at the Campaign for Tibet. And it occurred to me today that all of this meat eating contributes pretty significantly to global warming. We’ve all heard how cattle add to carbon dioxide and methane, which is no doubt the main thing, but also, the sort of plants that would be grown for human consumption are much more complex and would absorb much more carbon dioxide than the grass cattle eat. And of course, meat marketers like McDonalds are encroaching on rain forests and replacing them with land for cattle. Great points all, Ruben. Points that will be debated in terms of science, practicality, and logic. If the arguments remain there, without attempts to discuss the moral implication of mass animal killings, then, as The Dalai Lama pointed out, our eagerness to use animals for power and profit will (has) inevitably become a similar exploitation of human beings. The real issue is not what to do about global warming. Or eating meat. The real issue is what to do about the moral and psychological development of Human Beings. ON FURTHER REFLECTION: Having said that, I must admit, moral arguments are dime-a-dozen and tend to cancel each other out. The practical downsides of the global meat factory can be observed and proven through the scientific method (when applied by objective scientists who are not on McDonalds’ payroll).